Old Faithful Inn, Yellowstone NP, 1985. Old Faithful Inn is a massive building within a short viewing distance of Old Faithful Geyser, the most famous geyser in the United States. The building is an exposed log and wood-frame structure of rustic design and gigantic proportions: nearly 700 feet in length and a central core seven stories high. The building was constructed in three major phases: the 1903 original section (known as the Old House) with the imposing gable roof, dining room and kitchen wings to the south, and small guest-room wings to the east and west; the 1913-14 east wing; and the 1927 west wing. The building faces north, oriented toward the old "circuit road" rather that toward the geyser. The building was designed by architect Robert Reamer. The foundation of the 1903 portion is stone, or concrete with a stone veneer. The first floor structure consists of load-bearing log walls, and log framing. Upper stories are of milled lumber and log framing, and are sheathed with yard-long shingles on the exterior. The two bottom shingle courses have lower edges sawn in a diamond pattern. The central portion of the building, with its massive gable roof is the dominant architectural feature on the exterior. The roof comprises six of the seven stories. A widow's walk with five flagstaffs at its edges surrounds the top of the roof. At one time the widow's walk did have spotlights to light nightime viewing of old Faithful, but these were removed in 1948. The main gable roof is pierced by three stories of dormers and multi-light casement windows on the gable ends that provide natural light to the lobby and guest rooms. Two dormers have false windows which are presumably for exterior decoration only. Projecting out from the eaves of the main gable are outlookers supported by gnarled log brackets (outriggers). The original porte-cochere was recessed under the large gable roof of this central portion, along with a second-story porch directly above it. When the porte-cochere was extended out in front of the building in 1927, a portion on the ground floor was enclosed and became part of the lobby. The second-story porch was also extended out to provide for better viewing of Old Faithful geyser; this extension was not roofed. Piers supporting the porte-cochere and porch are surrounded by battered log cribbing, adding distinction to the structure. The two original wings are three and a half stories in height and flank the central portion to the east and west. The second story overhangs the first story by two feet. These small wings have multiple gable roofs pierced by dormers of varying sizes. With the exception of the large plate glass windows on the north side of the lobby, windows in the Old House are usually single and paired casements with various multi-light patterns of diamonds, circles, and rectangles. Access into the front (north) of the building is through a door constructed of large planks with wrought iron hinges and a lock forged on-site by a blacksmith. Undoubtedly the most impressive space in the interior is the seven-story lobby that climbs ninety-two feet from the floor. The lobby is surrounded by two levels of balconies built on log framing. The lower balcony encircles all four walls of the lobby and provides access to the porches over the porte-cochere on the north side and overlooks the dining room on the south side; the upper balcony is L-shaped in plan and runs along the north and west walls. Supporting the main gable roof are a series of trusses, oriented east-west, that are in turn supported by the log framing below. Climbing up from the second balcony is a staircase leading up to the "Crow's Nest"--a separate small landing near the roof where musicians played for the enjoyment of guests far below during the early days of the Inn. The gnarled log brackets attached to the log columns of the framing serve no structural purpose, and were put there solely for decoration. Similar rustic log work is used for balcony railings, balustrades along staircases, and brackets under the eaves. Stair treads are half-logs. The structural logs of the interior spaces originally had bark on them but now are peeled. The ceilings in the lobby are half-logs laid to look like a purlin roof. A stone fireplace, sixteen feet square at its base, dominates the southeast corner of the lobby. The upper portion of the fireplace on the north side holds a massive wrought-iron and brass clock, designed by Reamer. The chimney, exposed on the interior, is of stone masonry. The original stack on the exterior was of brick construction, sheathed with log cribbing similar to that of the piers for the porte-cochere. The original dining room to the south of the lobby has a roof structure of exposed log scissors trusses. Ceiling and walls are exposed half-logs and logs, respectively. A large stone fireplace is centered on the south wall, constructed of the same rubble masonry as the lobby fireplace. Hallways at the east and west of the lobby lead to guest rooms in the wings of the Old House. Guest rooms in both of these wings retain considerable original character. Those on the first floor have rustic log walls. Interior finishes for guest rooms on the upper stories are rough-sawn paneling on walls and ceiling. Some of these rooms retain original plumbing fixtures: clawfoot bathtubs, wood water closets, and marble sink tops. Throughout the Old House are original furnishings adding to the integrity of the building and its spaces. The lobby contains Mission furniture: loose-cushioned setees, rockers, arm chairs, wing-back chairs, octagonal base tables with leather tops and brass studded trim, writing desks and chairs. The dining room still has the original rustic hickory chairs from the Old Hickory Furniture Company. Leather-topped tables with brass studs are in the Bear Pit. Some of the bedrooms have the original iron bedsteads, dressers, and wash stands. Also contributing to the interior integrity of the Old House are the original electric lighting fixtures: copper and iron chandeliers in the lobby and dining room; and wood candelabra of rustic design serving as the capitals of the log columns supporting the balconies. The building has undergone many changes in its eighty-two-year history. The east wing of the Inn, containing 100 additional guest rooms, was constructed in 1913-14. The east wing is connected to the original section by a two-story passageway. The upper story of the passageway is open, and edged with rustic railings and fretwork. The lower story is enclosed. The east wing proper is of frame construction and is three stories in height. Exterior walls are covered with cedar shingles. Corners of this wing are articulated by log cribbing and three-story log outriggers resting on a rubble-veneered concrete foundation. Other sections of the foundation are concrete sheathed with logs. The roof is flat, with shed extensions running the lengths of the long sides. Windows are double hung, with ten lights above and one below. The east wing has undergone few changes other than cosmetic ones since construction, but has no outstanding interior features. A steel frame fire escape and concrete handicapped access ramp were added on the exterior of the eastern end of this wing during the early 1980s. A guest room in the northwest corner of the lobby was remodelled into an art gallery in 1915. An addition was constructed on the dining room in 1922. A concrete platform to serve as a loading dock for the kitchen at the rear of the building was constructed in 1923. That same year the red-painted cedar shingles of the roof were replaced, but only portions of the new roof were painted red. Changes to the lobby in 1923 included moving the registration desk from the southwest to the northeast corner, and creating a bellhop's desk by removing two guest rooms opposite the new registration desk. Some structural work was done to replace the support provided by the load-bearing walls of the guest rooms that were removed. Existing fire escapes were updated in 1925. A concrete floor was poured around the base of the fireplace in the lobby in 1926. The west wing was constructed in 1927. It added 150 guest rooms and 95 bathrooms to the Inn. The west wing is Y-shaped in plan. Exterior siding is cedar shingles. A two-story lobby space connects this wing with the 1903 section. The wing is four stories in height, and is of wood frame construction with a concrete foundation. The roof is flat, with a mansard edge around the fourth floor (not a true mansard roof). The mansard edge is consistently broken by the shed-roofed dormers of the fourth floor windows. A four-story bay with log exterior corners houses the staircase at the western end of the wing. Windows are six-over-six and eight-over-one double hung. The interiors have undergone periodic updating, particularly from 1975-77 when one hundred rooms were rehabilitated. The west wing contains no outstandingly significant interior features. During 1927 the lobby was expanded. The north wall was removed and extended forward to the porte-cochere. Timber columns were put in the place of the old wall to support the balconies above. The original door and windows were used in the new front wall. At the same time the porte-cochere was extended to the north, as detailed earlier. The east and west walls of the lobby were extended several feet to the north. Five guest rooms on the northwest corner of the original structure were removed to make room for gift shops. That same year a third multi-sided addition was constructed on the dining room. In 1932, the entire roof of the Old House was painted red. The Bear Pit cocktail lounge was constructed to the west of the lobby between the western wing of the Old House and the kitchen addition at the rear (southwest) of the building. Logs in the lobby were peeled and treated in 1940, and bark was removed at that time. The dining room floor was replaced at the same time. In approximately 1943, some diagonal timbers were added to the truss system to better support the lobby roof during heavy snows. During 1947-48, the roof of the original section, except for the dining room, was reshingled. A Grinnell sprinkler system was added then, and fire doors were installed in the east and west wings. The dining room was re-roofed in 1953. The building withstood an earthquake in 1959, but the the dining room fireplace collapsed and caused considerable roof damage which was repaired. The earthquake also caused damage to the lobby chimney stack, causing bricks to block two of the four flues. The steel stack braced by guy wires replaced the old chimney above the roof line at that time. In 1962, the Bear Pit bar was converted to a coffee shop, and the eastern portion of the dining area became the new Bear Pit. The present Indian art shop was placed in the northwest corner of the lobby in 1964. Original plumbing pipes were replaced with copper pipes during 1960-1965. In 1968 windows on the upper portion of the south wall of the original dining room were filled in. Following a cleaning with compressed air in 1971, the lobby woodwork including the logs on the underside of the roof was coated with a clear satin varnish. A concrete ramp for wheelchair access was added on the west side of the porte-cochere. The main gable roof, its dormers, and some sections of exterior walls were reshingled in the early 1980s. Some wood structural repairs were made under the same contract. Fire escapes were constructed on the east and west wings in 1980. The interior spaces of the kitchen were completely rebuilt and remodelled in 1981-82. In 1983 a series of changes included the addition of smoke enclosures and public restrooms in the old west wing, new restrooms in the old house and wings, piping and tunnel improvements, and new wiring and fixtures at the front desk. Plans are underway now to restore the integrity of the lobby space. The building is closed during the winter, but remains open the rest of the year. Thousands of visitors each year partake of the spatial experiences of walking under the porte-cochere, into the rustic lobby, up on the balconies, and out on the porch to watch Old Faithful erupt. Most do not stay at the Inn; but they are drawn to the building because of the sense of place it creates. They come to Old Faithful Inn to experience the visual and tactile luxury of what one architect and hundreds of skilled craftsmen did with wood and stone. Old Faithful Inn is one of the few remaining log hotels in the United States. The Inn is a masterpiece of rustic architecture in its stylized design and fine craftsmanship. Its influence on American architecture, particularly park architecture, was immeasurable in its uses of natural materials to create a feeling of high-style rusticity. In a broad sense the design of the Inn parallels architectural ideas being used in hotel construction today with its enormous multi-story lobby surrounded by levels of galleries. Old Faithful Inn undoubtedly is the queen of rustic hotels in the national parks. Its use of natural materials, allusions to pioneer building techniques, and strong ties with its site through the use of onsite materials are three key principles of rustic design with which National Park Service architects worked through World War II. The log walls, gnarled log brackets and balustrades, and natural finishes on the warm wood on the interior no doubt relate back to the work of William West Durant in his Adirondack buildings of the 1870s. The sheer scale of the building and the extreme exaggeration of many of its architectural features leave the building with a western frontier sense of size, space, and grandeur. Certain anglo-colonial features such as the second-story overhang and the diamond-mullioned windows cannot be overlooked, but they are subdued by the overall rustic character of the building. The Northern Pacific Railroad and its former subsidiary the Yellowstone Park Association financed the construction of Old Faithful Inn at a cost of approximately $140,000, with an additional $25,000 for furnishings. The Department of the Interior gave permission for building materials such as stone, timber, and clay for bricks to be gathered within the park boundaries. The Association chose Robert Reamer as architect for the building. Reamer was originally from Ohio, and had worked for the New York, New Haven, and Hartford Railroad before coming west with the Northern Pacific to design their Gardiner, Montana depot. He was 29 when the Association hired him to design the Inn, and he was said to have "sketched the plans while coming shakily out of a monumental submersion in malt, and some authorities claim to be able to read that fact in its unique contours." The Yellowstone Park Association, after suffering the loss by fire of the Upper Geyser Basin Hotel, was under pressure by the federal government to provide good tourist accommodations in that area. What the Yellowstone Park Association needed was lodging to house the great numbers of visitors coming to the area by train. They wanted a building constructed just at the legislated 1/8-mile distance from Old Faithful geyser, built out of as many available materials as they could use from the area to defray costs, but with an identifiable character. What they ended up with is a unique structure that in some ways became a destination in itself, and a building that enhanced the visitor's western frontier/park experience. The building retains today that strong sense of place. More than any other building in any national park, Old Faithful Inn not only met but far exceeded the concessioner's ideas for development. Reamer did not repeat his heavy-handed, baroque use of materials in the 1913 and 1914 wings. The original building's emphasis on battered foundations and axe-cut log work was not repeated with the same success as in the original structure. The additions were not nearly the architectural quality of the original structure, but at least they were designed with relative compatibility. The rustic sense remained overwhelming. The success of Old Faithful Inn's sense of place and image undoubtedly had an impact on development funded by railroads and concessioners in other national parks. Initial construction costs often ended up being small in comparison to the image that they bought. Image meant tourism, and tourism meant business. The Santa Fe Railway recognized this two years later at Grand Canyon when they began constructing El Tovar. Other railroads followed suit. Large hotel chains today are still emphasizing distinction in exterior design and multi-story lobby spaces as much as Reamer did in Old Faithful Inn. The Hyatt Regency in San Francisco, the Clarion in St. Louis, the Bonaventure in Los Angeles, and numerous others throughout the nation all have unusual exterior design that separates them from the glass and steel boxes around them. Also, they all have enormous multi-story lobbies that are gathering places for their guests and for city residents who enjoy watching the activities below from the concrete and steel balconies and who like to ride the glass enclosed elevators to experience the spatial sequences from different viewpoints. Reamer did exactly the same thing in the Old Faithful lobby with his balconies and staircases. Although he was not the first to design a multi-story hotel lobby , Reamer was the first to do it in natural materials in such a massive scale. Today the materials are very different--steel, glass, concrete, and high-tech lighting systems, rather than gnarled logs and rough-sawn wood. And the feeling is very different -- urban, noisier, and flashier, rather than warm and comforting. But the end result is the same. People enjoy experiencing different spaces and the feelings they evoke, and enjoy interacting with others doing the same thing. In a natural setting Reamer created one of the most enjoyable architectural experiences in any national park. 1 Robert Shankland, Steve Mather of the National Parks (New York: Alfred A. Knopf, 1954), p. 117. 2 Susan Scofield and Jeremy Schmidt, The Inn at Old Faithful, (Crowsnest Associates, 1979), p. 23. 3 The concept of a hotel with a multi-story lobby surrounded by galleries developed as an American phenomenon. Asher Benjamin designed the first in 1806--the Exchange Coffee House in Boston with five levels of galleries surrounding a central lobby--less than 100 years prior to Old Faithful. Although the Coffee House housed additional functions, its upper stories contained hotel accommodations. Clemensen, A. Berle. Historic Structure Report, Historical Data Section, Old Faithful Inn, Yellowstone National Park, Wyoming. Denver: National Park Service, Denver Service Center, 1982. National Park Service files including LCS and National Register files, and various construction documents. Pevsner, Nikolaus. A History of Building Types. Princeton, New Jersey: Princeton University Press, Bollingen Series XXXV--19, 1976. Scofield, Susan and Jeremy Schmidt. The Inn at Old Faithful. Yellowstone National Park (? ): Crowsnest Associates, 1979. Shankland, Robert. Steve Mather of the National Parks. New York, Alfred A. Knopf, 1954. Tweed, William C., and Laura E. Soulliere and Henry G. Law. 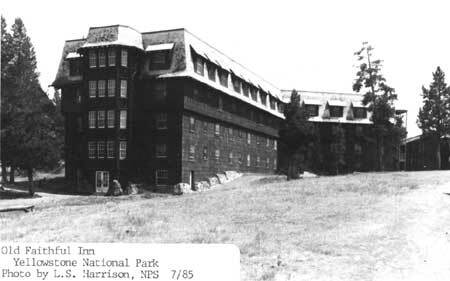 National Park Service Rustic Architecture: 1916-1942. San Francisco: National Park Service, 1977. The Boundary is the dotted line on the enclosed Site Planning Map of Old Faithful and Vicinity (omitted from on-line edition).